Vancouver, British Columbia; Chambar Restaurant, Forage Restaurant, Granville Island Public Market, Living Produce Aisle, PNE Amphitheater, Rodney's Oyster House, On Yogurt, Vancouver Art Gallery, Vancouver Water Adventures, the Yaletown neighborhood. Tim surprised me with tickets to see one of our favorite bands, Kaleo, at PNE Amphitheater for my birthday, which provided a terrific foundation for a fabulous family weekend getaway. 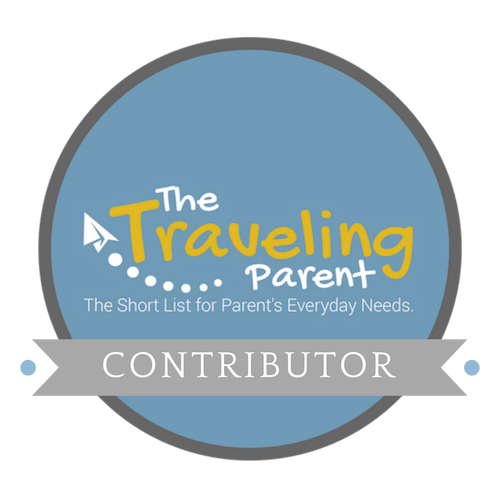 The icing on the cake was that Bella was a curious, adventurous traveler, even though she was stuck hanging out with her parents! For decades, I have preferred to wander and explore without an agenda, but I have come to appreciate the well researched travel approach where we book 2-3 experiences that seem to meet our "quintessential bar" to anchor the trip. Prior to heading to Vancouver for this trip, we sought out a farm-to-table restaurant for our pre-concert dinner, bought tickets to a show and also made reservations to take a zodiac boat tour prior to heading back to Seattle. Wandering around in the in-between times offered the perfect balance for a fun weekend getaway. For those who haven't been to Vancouver, BC, it is a dense, world-class city nestled at sea-level and surrounded by towering mountains. It is a city of neighborhoods and very walkable. For local happenings, a great resource is The Straight event calendar on the Vancouver weekly's website. You will be amazed at the countless al fresco dining options, each bathed in beautiful ambiance. Canadians sure seem to love their outdoor dining spaces. Every city should be so fortunate. We did not have time to experience the entire complex, which was built as an exposition center for the 1910 world's fair, but in addition to the outdoor amphitheater, it has a beautiful Japanese Garden and an amusement park called Playland. The amphitheater has very good acoustics and stadium-style bench seating, with killer views of the mountains. If you go to a show, be sure to take hats because the sun sets behind the stage and research transportation options if you are not driving your own car. Vancouver does not have Lyft or Uber and the cabs are impossible to get outside the venue after a concert. It has an interesting collection of Canadian art, as well as travelling exhibits. We took a tour of the "Cabin Fever" exhibit, which featured a curated mix of images referencing history of the cabin as primary shelter and comparing that to today's cabin as a second home, or place of retreat. There is a model replica of Henry David Thoreau's cabin on Walden Pond. Don't miss the lovely cafe and outside terrace on the second floor, where you can get a snack or meal. We had never experienced Vancouver from the water, so we decided to book a guided 90-minute Zodiak boat tour with Vancouver Water Adventures on Granville Island and were so happy that we did! I would say that it was a highlight of the weekend. Our guide Darrell was friendly, full of fun facts about the area and an adept captain. The tour took us to view the Lion's Gate Bridge that connects Stanley Park to the mainland, celebrity (Will Smith, Michael Jordan, Robert Di Nero and Ivanka Trump) homes along the West Vancouver waterfront, harbor seals, Lighthouse Point, and perhaps my favorite, the cargo ships anchored in the bay. The cargo ships were gigantic and Captain Darrell took us up-close and then zoomed us in and out of several ships while driving the boat at top speed. Bella and Tim loved that part, and I kept my head down and closed my eyes. Next time we go back, I want to take the 3-hour Zodiak tour that takes you up to nearby waterfalls. Granville Island is chock full of local art, food and performers. In fact, the public market has the most impressive "food court" I have ever seen. Each food booth features a different cuisine with the freshest of ingredients. If you want to take in performing arts while in Vancouver, check out the Arts Club Theater Company, which has a space near the market. We had two notable meals during our weekend in Vancouver. A random happenstance breakfast at Chambar Restaurant featured Belgian cuisine with quality, freshness and flavor at the core of every offering. The cozy, heated outdoor patio surrounded by lush plantings should not be overlooked. The other memorable meal we had was at Forage, an award-winning farm-to-table restaurant in the Robson district. They focus on locally-sourced ingredients (down to their licquers) and fresh-made dishes served family style. Forage employs 3 full-time foragers to stay true to this promise! This could be one of the best Pacific Northwest cuisine meals that Tim and I have ever had! Bella even found dishes that she loved and the bartender made her a house-made elderflower syrup spritzer. 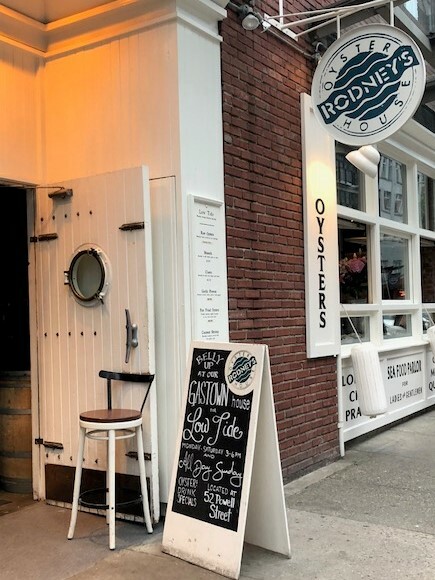 I would be remiss if I didn't mention one of our favorite Pacific Northwest seafood restaurants, Rodney's Oyster House, in Yaletown. The ambiance is spot on, you actually feel like you are dining at the seashore where the fisherman haul fresh seafood in through the back door. The servers (as with most every place in Vancouver) are friendly and accommodating; and the seafood is fresh and perfectly prepared. Rodney's is the place where Tim tried his very first oyster, a gift from the bartender. Reservations are highly recommended at this popular spot. For a quieter, more upscale ambiance than Rodney’s, make reservations for the highly acclaimed Blue Water Cafe, where the seafood is fresh and the service is impeccable. 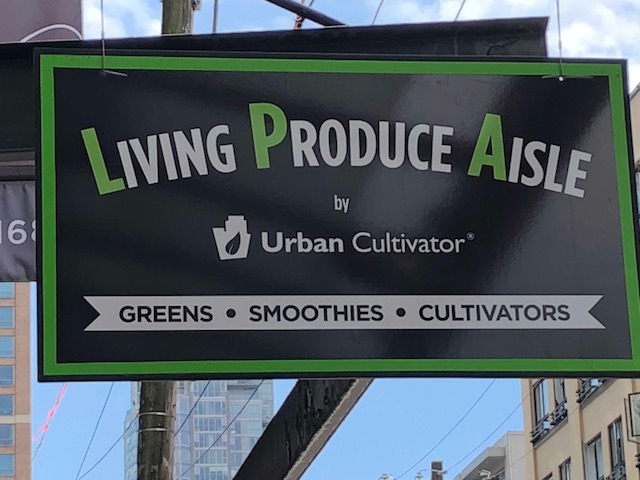 The Living Produce Aisle was an intriguing spontaneous find on our walk through Yaletown. This amazing little place grows micro-greens in hydroponic refrigerators (which are for sale to the public), but it is a juice shop. They hand harvest the necessary greens for your chosen juice, right after it is ordered! You can't get more fresh, delicious or nutritious than this place. Apparently, plants hold the most nutrients when they are at the micro-green stage, just after sprouting. Last, but not least...Bella was overjoyed when she realized that the viral-worthy "rolled yogurt" was in Vancouver! Tim and I had never heard of it before, but in we strolled to On Yogurt after dinner. We watched patiently as a yogurt-roller-chef cooked yogurt in a similar fashion to crepes. Once the flat disk looks cooked, the yogurt is rolled into cigar-like shapes and topped with things like fruit, syrup or candy. This is a popular, unique dessert and there seemed to be a constant line of people awaiting their treats. We used hotel points for this trip and stayed at the Yaletown Hampton Inn, which is nice and has an enclosed jacuzzi, workout equipment, foosball and ping pong tables on the roof. The Hampton Inn is located across from the sports arena and hit the mark for us because we only used our room for sleeping. Other considerations are the The Loden (award-winning luxury boutique hotel, centrally located); The Rosewood Hotel Georgia for the discerning luxury traveler who wants to be in the heart of the shopping district; the Buchan Hotel (a simple boutique hotel on a residential street near Stanley Park); or the Westin Bayshore located right on the seawall trail (which extends nearly 30 miles around the downtown and Stanley Park). Younger travelers looking to party it up should consider staying at Yaletown's Opus Hotel, which has a nightclub on first floor. ABILITY TO UNPLUG: Medium. There is cell and data coverage, but you might only want to use it if you have an International roaming plan. Even so, the data and google maps can be slow. 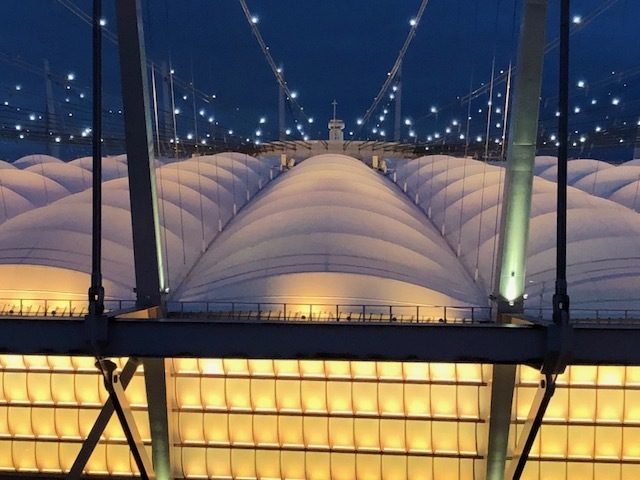 If you are driving into Vancouver from the States, don't forget your passport and try and arrive at the Border before 2 p.m. to avoid the traffic to get through the Everett Boeing traffic and the stacks of cars trying to head north into Vancouver. If you do get across the border later and want to wait out the traffic, take a 10-minute drive detour to the quaint, Southern California Coast-like town of White Rock and find Marine Avenue. There about a mile's worth of restaurants, bars and shops directly across from a beautiful beach. We like the Boathouse Restaurant's rooftop deck. For a few other suggestions in the Vancouver area, check out my article on British Columbia's Sunshine Coast.